Grainger Public Relations » Cracking Chemistry & Festive Fun! ‘Cracking Chemistry and Festive Fun’ will demonstrate some sensational, seasonal, science experiments to amaze and delight visitors of all ages. In what is the final ‘Meet the Experts’ event of the year, scientists from the Chemistry Department of the University of St Andrews will be helping visitors create giant glowsticks, make traffic lights, explore the smelly science behind fragrance, and build a battery to light an LED and make a low-cost light bulb. 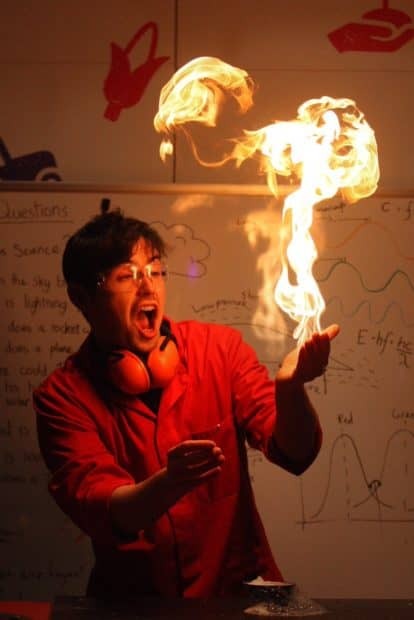 Meanwhile, the Dundee Science Centre team will be showcasing sheer fire-power, explaining what fire actually is through some breathtaking fire demos. Youngsters can also make some slime and watch it dance, see what happens when they eat their Christmas meal and make ‘the perfect poo’, and explore their insides with giant rag doll Stuffee. Last but by no means least, the ‘Have you Ever Wondered Show?’ will answer some of the questions the Science Centre has received over the years, from why the sky is blue to how planes fly! The University of St Andrews activities will run from 12.30 until 3.30pm. All other activities will take place regularly throughout the day and are included as part of normal admission. ‘Meet the Expert’ events will continue on the second Saturday of each month from February 2017 onwards – details of the programme will be available soon on the Dundee Science Centre website – www.dundeesciencecentre.org.uk. Dundee Science Centre is open daily from 10am-5pm.